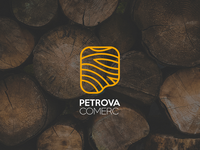 Petrova Comerc is a traditional woodwork based in Kosovo. I was fortunate enough to do the rebrand of the company. First I simplified the initial " P " and incorporated the wood lines on it so it gives an abstract form of the tree stump.